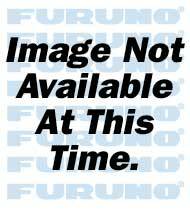 Browse the Furuno product catalog for current and previous products. All prices shown are in USD. Prices are valid in US and Canada only. 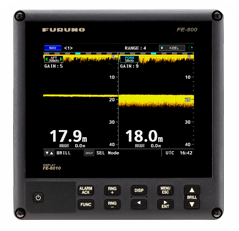 The FE800 is a result of Furuno's many decades of experience developing echo sounders, sonars, and underwater application equipment and systems. This echo sounder is a breakthrough over the conventional paper sounders; there are no consumable items. The purpose of the echo sounder is to provide safe navigation by detecting the clearance below the ship (particularly in shallow waters) as required on the SOLAS Convention ships by the new IMO standards. The basic system consists of a display unit and distribution box. The 8.4" high-brightness color LCD display offers an easy-to-read depth sounding in various modes, permitting optimum representation with respect to the environment. The FE800 generates alerts when the water depth below the transducer is shallower than the preset depth. When the seabed is lost due to the lowered power supply or out of range scale, an alert is generated. The receiver sensitivity is automatically controlled with the tracking depth; manual override is possible to improve the detection and to reduce the surface clutter. View your Own Ship Data (OS Data) when the FE800 is connected to an external GPS Navigator. Display a combination of Contour and Strata echo readings in preset intervals of 5 seconds, 1 minute or 2 minutes. Display the stored time, depth and own ship position. The logbook is capable of storing data for up to 720 log entries. Displays up to 100 alerts stored in history. For more information, including dimensions and product specifications, download the brochure.